Unequaled production is attained through a cycle time unmatched by two bladed shears. Eight full strokes per minute allow for shearing that may well exceed your ability to move from tree to tree. 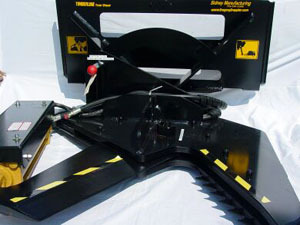 The Tree Shear is always ready when you are. Several other distinct advantages of single bladed shears are these. Obviously less moving parts means less to break and less to maintain. Alignment is always true. Trees cut with double bladed shears fall at random. Trees sheared with our shear almost always fall the direction of the blades' travel. Two bladed shears try to combat this danger by an accompanying clamping system. We have sworn this off since large trees or even moderately sized trees in high winds may create a dangerous situation for the operator. They are also rendered useless on steep inclines and with trees that have dense low foliage like we see in most unmanaged stands of trees. 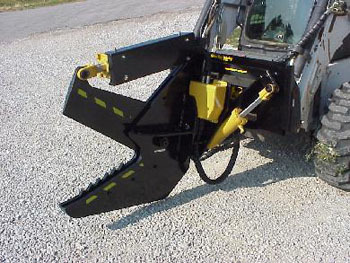 This shear has limitless applications in the timber/logging, reclamation, residential development, farming/ranch, or any other job that may require timber or brush removal. Starting small, the shear can tear through acres of stag horn sumac, plum thickets, or any other dense volunteer growth that may have gotten away from you. On a larger scale, large pastures of volunteer cedar trees that can easily inundate your grazing acres can be cleared single handedly in a fraction of the time that any other method could produce. All vegetation is removed with little or no disturbance to the ground below it. 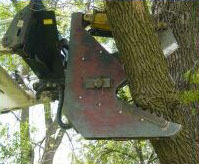 Harvesting of firewood or removal of larger specimens is a snap since the shear can take off a 14 inch tree in a single pass. Larger trees are easily felled in a second pass. The shear is not done there. 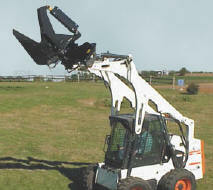 The entire head of the Tree Shear can be rotated 90 degrees to accommodate vertical cutting. Felled trees can be sectioned for ease of removal or clipped to length for firewood or compact loading. Reaching into the bows of standing trees allows you to prune them for health or minimize their size to lessen risk while felling trees in tight spaces.